The third place match will be played at 5pm local time in Brazil. This fixture is between two sides that have met six times before. The two nations share not only an identical record of 3 wins, 5 draws and 3 losses, but have also scored an exact 15 goals each in previous meetings. The match will take place at the 69,349 seat Estádio Nacional de Brasília Mané Garrincha, in the capital Brasilia. Brazil has played once before in this stadium, defeating Cameroon in the group stages 4-1. 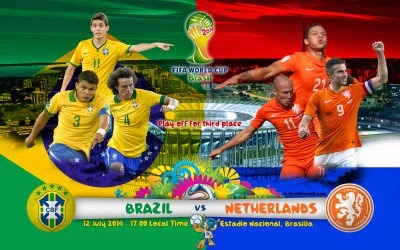 The Netherlands will be playing in the capital of Brazil for the first time in this tournament. Netherlands' star winger Arjen Robben has gone on record saying that he does not care for the 3rd place match whatsoever. Brazil on the other hand, have some unfinished business after their humiliating 7-1 loss to Germany, after which they must have a good showing in front of their home supporters in order to regain any kind of respect from their nation's faithful. Don't get your hopes up, Neymar will not be playing in this match. But the key ingredient that was missing against the Germans, captain and center-back Thiago Silva, will. Surely the Dutch don't want to finish off a decent World Cup run with two straight losses, but the Brazilians have much more riding on this fixture and are more likely to come out on their "front foot". For the Dutch it will most likely be Tim Krul who had played all of 46 seconds before becoming a Dutch hero, leading his nation to a penalty kick victory over the Ticos from Costa Rica. Van Gaal must show the keeper respect and give him the nod in this "match that doesn't matter". 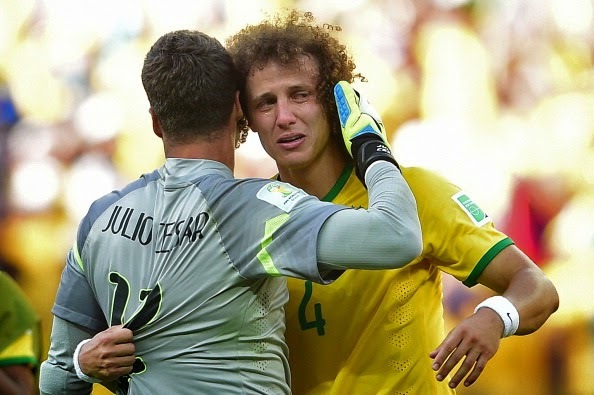 For the Brazilians it will be David Luiz. The newly aquired PSG center-back must show his new teammates that he can be relied on, because if he shows up to camp after the World Cup with nothing other than the loss to Germany to show for, he may as well spend all of next season on the bench while proving to his colleagues in training that he can get the job done.